I’ll be the first to admit that my Christmas themes are absolutely all over the place. Last year my tree was bedecked in the most colorful ornaments you have ever seen. My Christmas tree hanging out in the corner of my living room literally had all colors of the rainbow dripping from all 9 feet of it. PLUS I had a rotating Christmas tree stand so that business went ALL THE WAY AROUND… no hiding bare spots in the corner for me! This year I had thought to go very colorful and very glittery. But the trees I’m decorating this year won’t actually be in my home. They’ll be in my parents’ house instead. For the first time in over a decade, we’ll all be spending Christmas at home and it’s a lovely, lovely thing. My theme full of colors and flash and, well, gaudy business, wasn’t going to be well received by my dad. So my mom and I took back EVERYTHING (except for one wreath we forgot and my dad kept teasing us over) to start over, completely from scratch with a totally new theme. This year the Christmas trees I’m fixing up are more rustic and our theme is more classic Christmas colors and things found in nature than a colorful and crazy acid trip. My mom and I went out and purchased lots and lots and lots of ornaments for our 2 trees (one a 7.5 foot slender flocked beauty that everybody just loves that I intend to buy another of for my own home) and the other a 7 foot tall fat as all get-out sucker my parents bought when we were kids around 1992. When I left my parent’s house last month I had officially bedecked one tree but the other was pretty much untouched. After putting brand new Christmas lights to put on it that quickly started to burn out and got, like, scary freaking hot, everything that had been done had been taken down so that the lights could be returned. 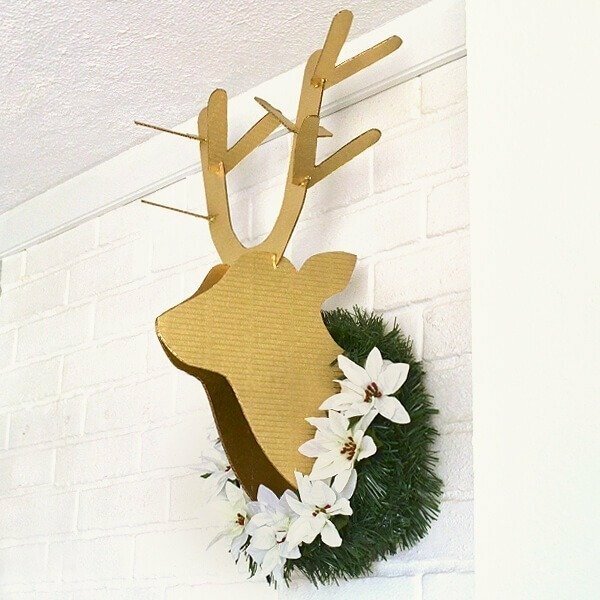 While I don’t have my own tree to adorn this year, I’m still excited about Christmas crafting. I think having got caught up in the spirit getting things ready for December at the ‘rents in early November, gave me lots and lots of time to think up some pretty awesome Christmas craft ideas. 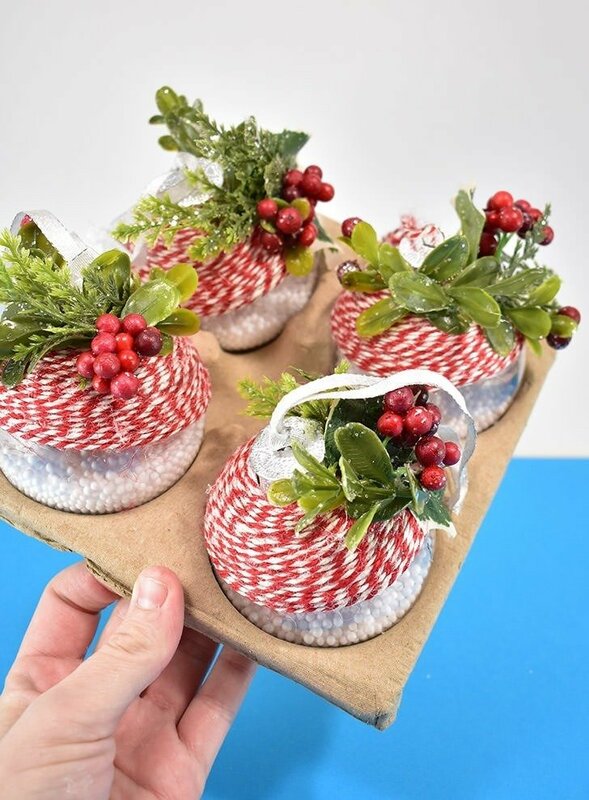 And today, I’m sharing some rustic Christmas ornaments made with simple materials, that cost me next to nothing, that have a lot of character for only a 5 minute time investment each. Not bad, right? 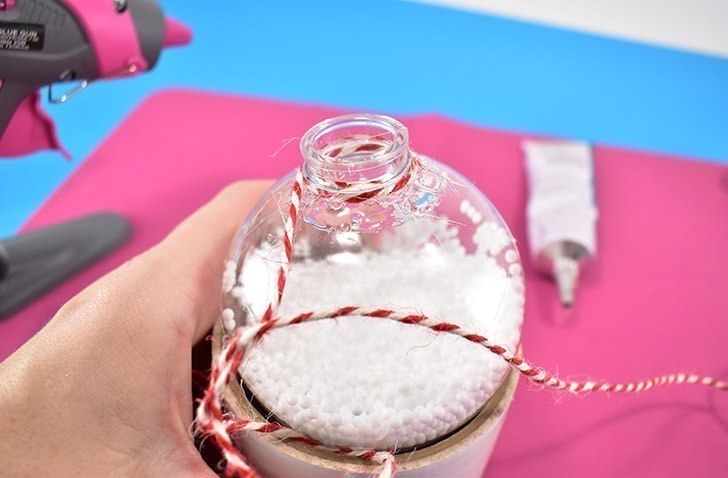 But before we get started, let’s talk about supplies… To keep things affordable I like to work out of my extensive craft stash whenever possible, but I did splurge a bit and snagged a brand new hot glue gun that is my fave new crafty thing because it has a stand! But for the bulk of my items, I went crafty cheap. The clear plastic ornaments were available at the Dollar Spot at Target, only $3 for 4 ornaments. The craft snow I also got there for $1 and I have about a quarter of the bag left over. The festive baker’s twine I got from Michael’s for only $1.50 on sale in the Christmas section (an impulse purchase that worked out well in the end, to be sure). My florals came from a mini-wreath, also at Michael’s that is marked $12, but that I got for only $4.80 and for this project I only used about a third of it. I also used Aleene’s Rapid Dry, another impulse buy I snagged at the store with a half off coupon when I had nothing else to use it on. As it turns out, this stuff is pretty fab. It smells terrible, like e6000, very chemically, but it dries super fast and super clear. PLUS once it’s dry if you’ve gotten it onto the surface where you shouldn’t have, once completely cured you can rub away the ugly smudges with your fingers. Cool, right? 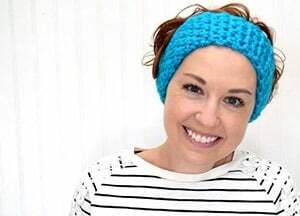 Now I’ve linked to supplies you can conveniently purchase online above, but know that if you’re willing to head to town you can save big bucks buying these things in-store instead. Ah, okay. 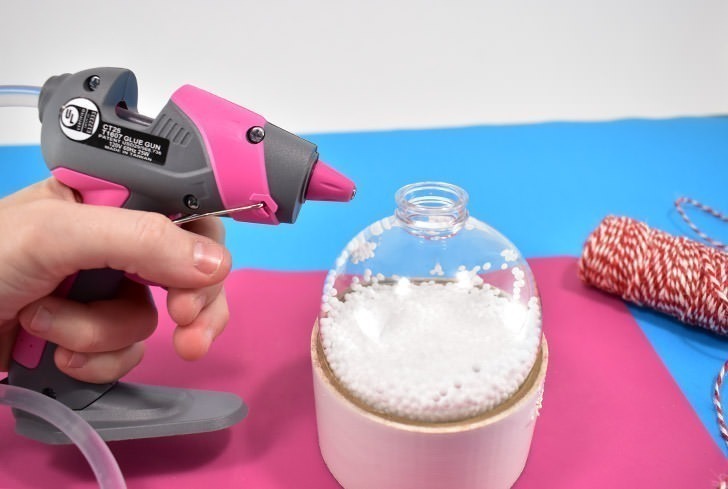 Let’s move on..
To start pull the little stopper lid business off of your ornaments. 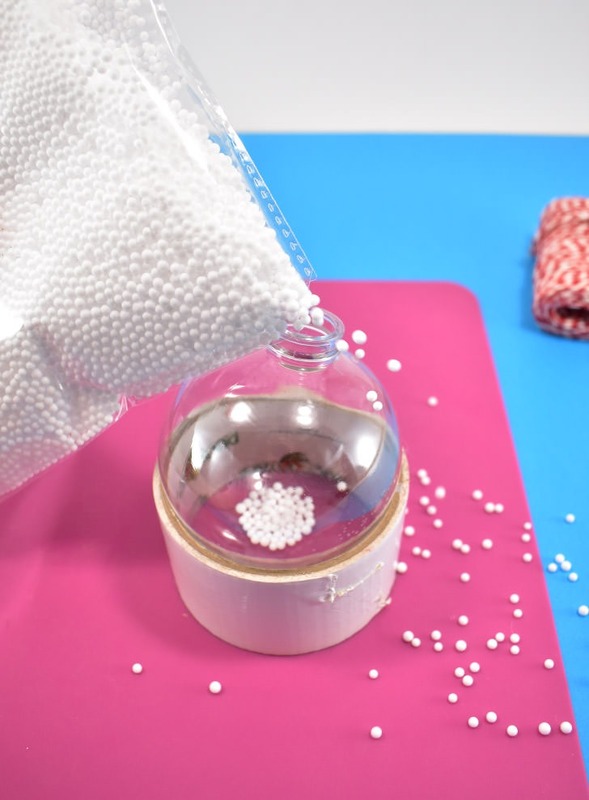 Cut a very small amount off of the corner of your styrofoam snow and pour into your ornaments to fill about halfway. This is a two-handed business to keep from making a mess, but as I was holding my camera things went very, very awry. These suckers are super keen on static electricity and will stick onto just about anything and are like magnets. 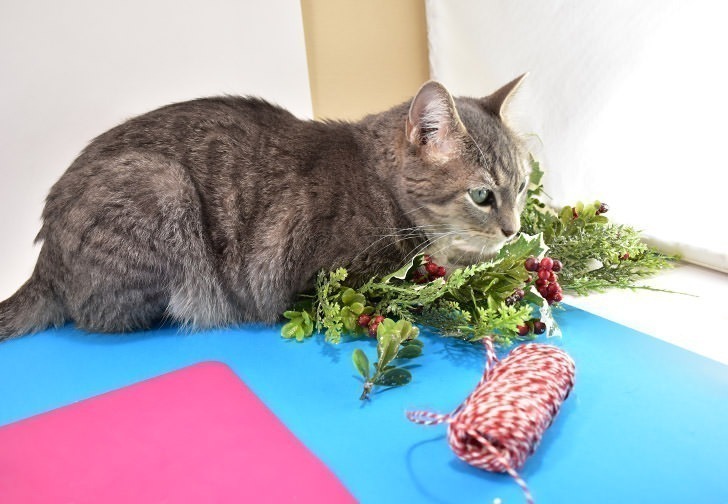 Once you’ve got a pile on the ground, they seem more likely to pile up on the outside of your ornaments than to flow neatly inside of it. 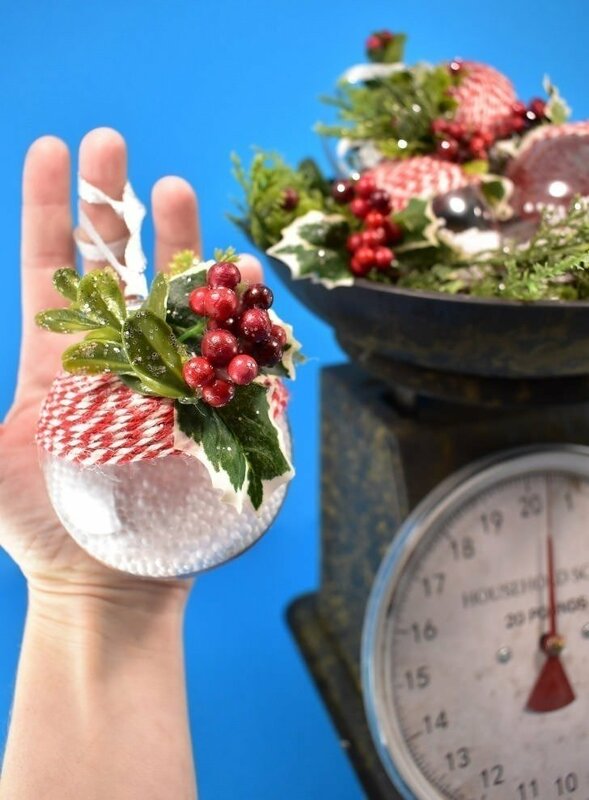 If you cut a big hole in your bag, or try to pour a handful into the ornament, you’re in for a total disaster of a mess! 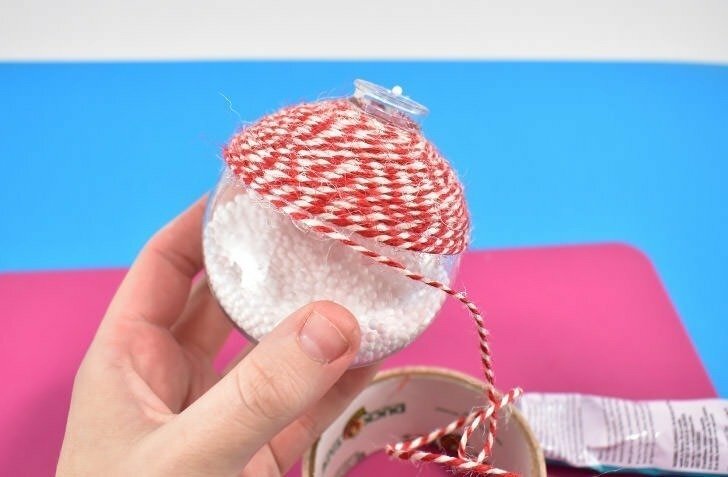 Oh, and to keep things steady, you can use a roll of tape to hold your ornament as you work so it doesn’t try to wobble and roll away from you! 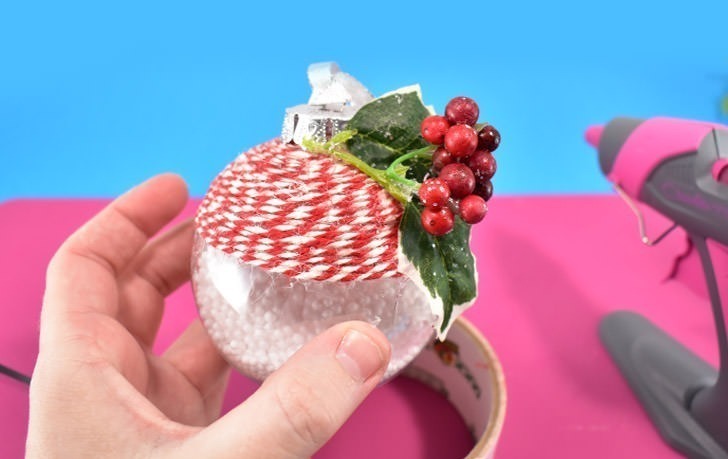 Using a hot glue gun, apply a small dab of glue on the top of the ornament right along the where the rim meets the rounded shape. Taking care because hot glue is, well, hot, push the end of your baker’s twine into the glue and allow a moment for the glue to cool and set. 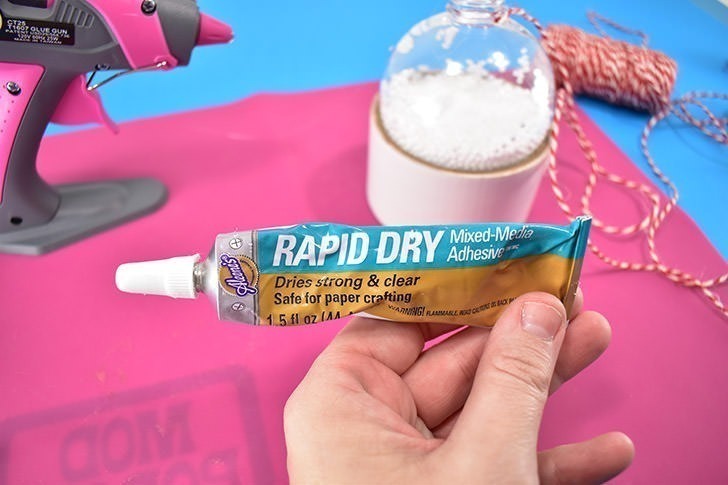 Apply about a ring of strong, quick-drying glue, like Aleene’s Rapid Dry, around the surface about a centimeter all of the way around. I say a centimeter because this stuff really, really does dry fast and any more will dry long before you can get to it. 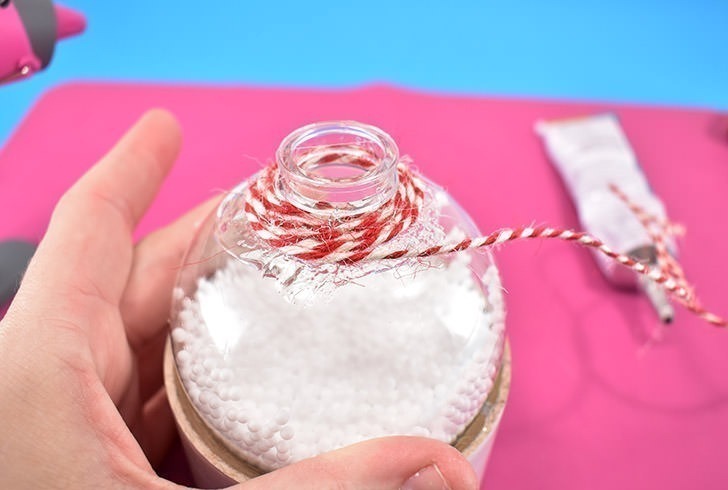 Carefully wrap the baker’s twine around the ornament pushing down into the glue as you go. 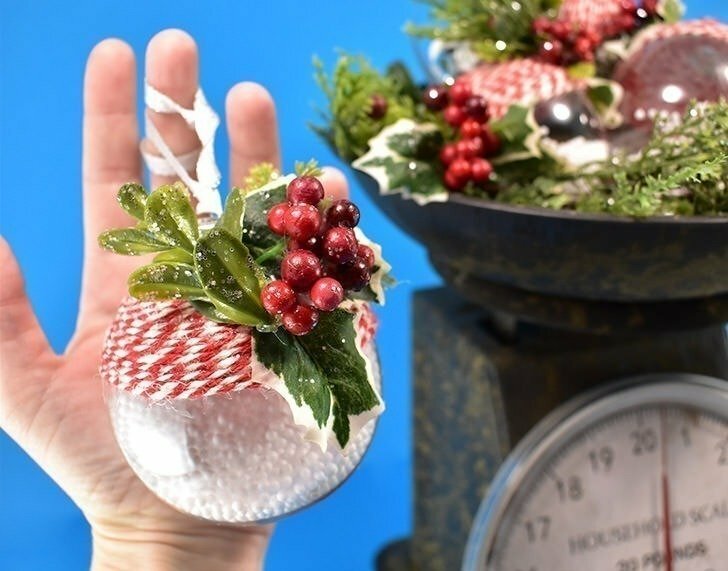 Continue working around and around, about a centimeter at a time until you’ve covered 1/3 to 1/2 of the ornament’s surface. 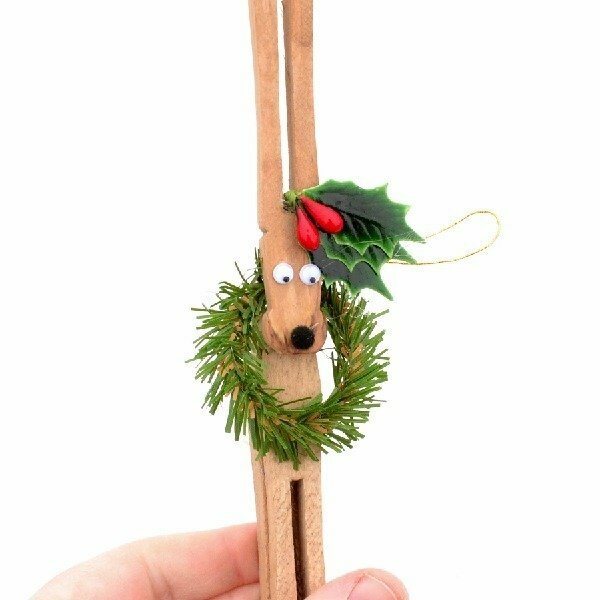 Trim the end of the twine and push it so that the end is well disguised and hold into the glue until it “grabs”. 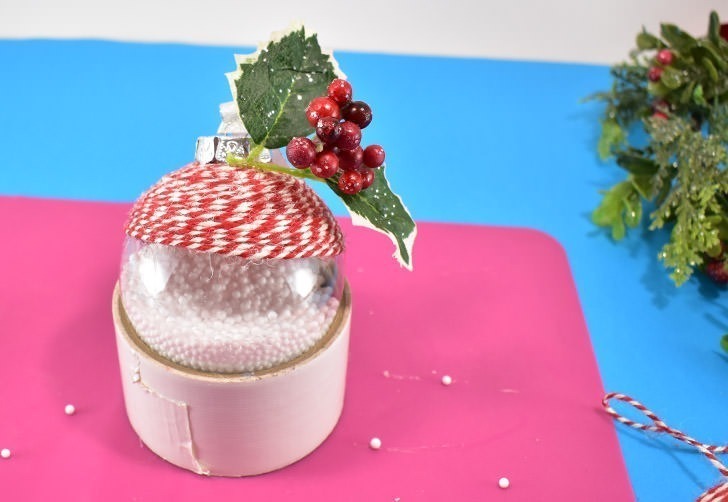 Replace the lid/stopper business in the top of the ornament and grab your trusty hot glue gun. 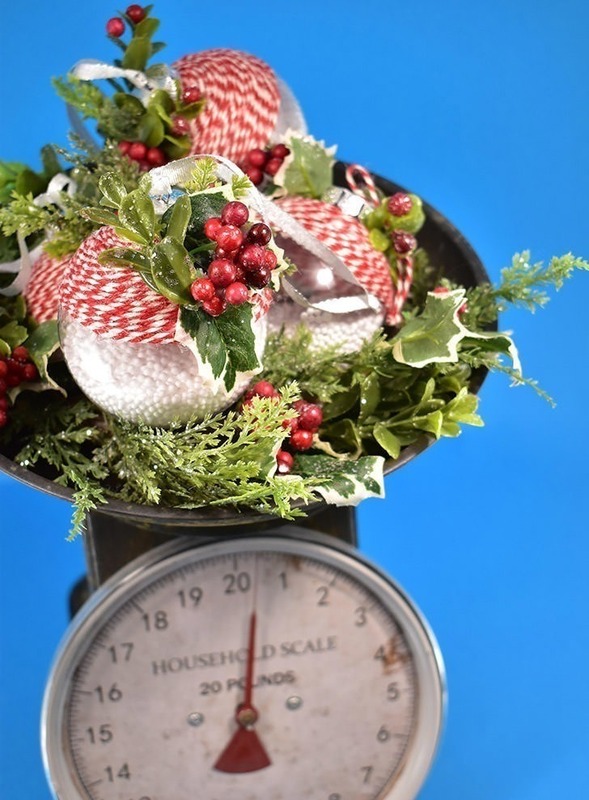 Taking small snips of Christmas florals, like holly, berries, pine, etc. and begin affixing using your hot glue in a clump around the holder. If things stick out at weird angles, simply tack them down to the surface of the ornament in an attractive way. 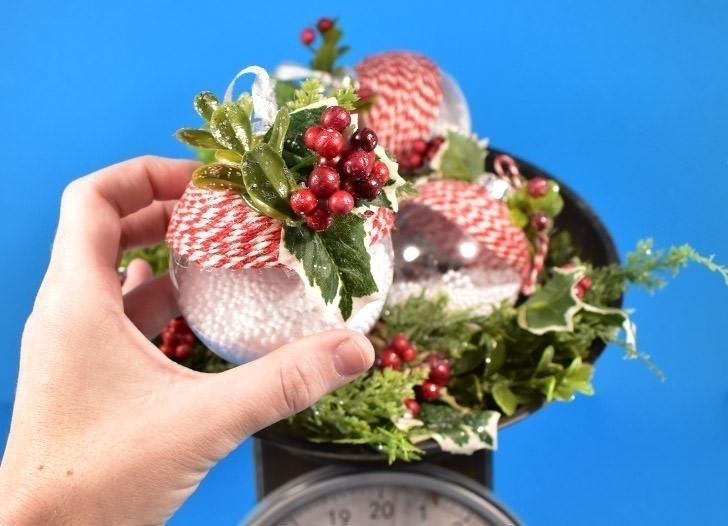 Continue filling that business out, covering any obvious ends until what you have looks like a gorgeous little Christmas corsage! 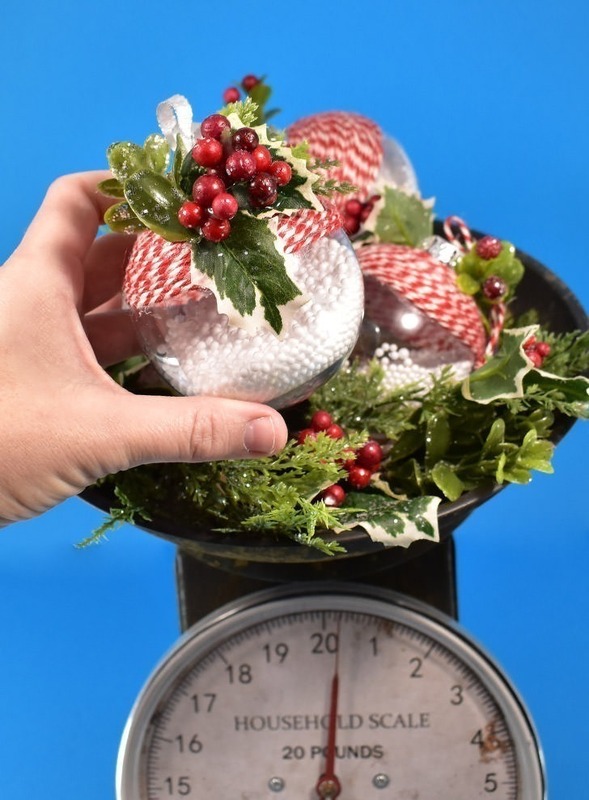 Continue for as many ornaments as you need to doll up! Here are my 4 in their original Target packaging, which, oddly enough, totally goes with their look doesn’t it? AND it only took me 20 minutes to make all 4 from start to finish. 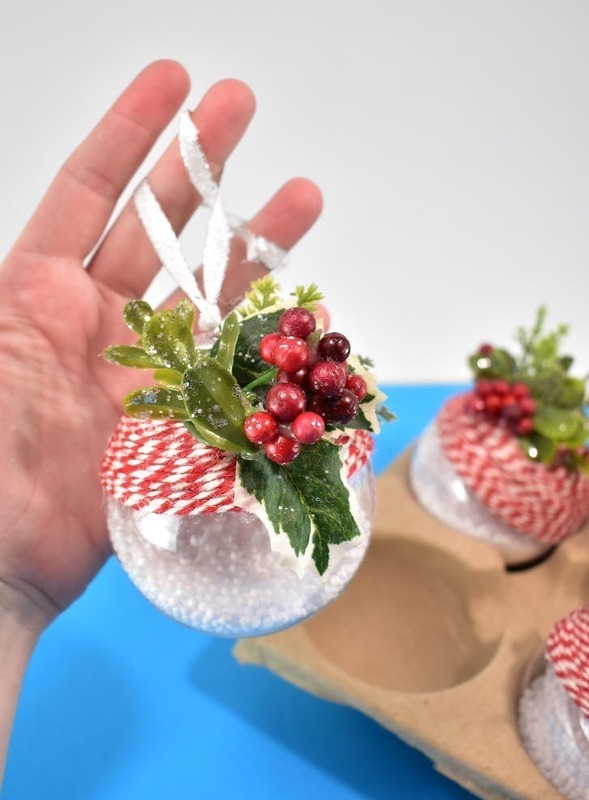 Inexpensive, fast, and adorable rustic Christmas ornaments for the win!